Clear Channel digital billboard at intersection of Silverlake Blvd. & Effie St. The digital billboard in Silverlake that caused a community uproar when it first appeared two years ago has been turned off—at least for now. The electronic, jumbotron-like sign is in the district of L.A. City Council President Eric Garcetti, who has publicly stated in the past that the intensely bright, rapidly changing ads are out of place in the small commercial area closely surrounded by single-family homes and apartment houses. Contacted by Ban Billboard Blight, Garcetti said Clear Channel had voluntarily agreed to turn off the billboard. He said he didn’t know if the company intended to keep it off permanently, but an informed source told us that the company wants to relocate the billboard to another area in the Silverlake community. Given that the 101 digital billboards now operating in L.A. were permitted by a lawsuit settlement thrown out by a Circuit Court judge late last year, it’s difficult to see how Clear Channel could get a permit to convert an alternate billboard to digital. Clear Channel’s Director of Public Affairs for Los Angeles did not respond to an e-mail inquiry about the situation. 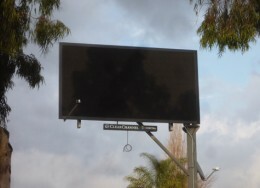 There is no evidence that any of the other digital billboards operated by Clear Channel and CBS outdoor in the city have been shut off, although numerous complaints about traffic safety and light trespass into residences have been raised in a wide area of the city, including Hollywood, the mid-Wilshire area, West L.A., Westwood and Venice.